Embroidered on 100% cotton twillSpecifications:Fabric: 100% cotton twillStructure: StructuredProfile: MidClosure: Hook and loop..
Embroidered on 100% brushed cotton twillSpecifications:Embroidered Fabric: 100% brushed cotton twill Structure: Structured Profile: Mid Closure: Hook and loop .. 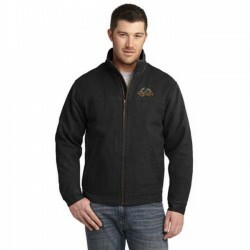 Specifications:Embroidered 12-ounce, 100% cotton enzyme washed duck cloth 100% acrylic flannel body lining 3-ounce polyfill quilted polyester sleeve lining Adjustable snap cuffs Front slash pockets with hidden snap cl.. Specifications:Embroidered Fabric: 100% cotton brushed twill Structure: Structured Profile: Mid Closure: Self-fabric adjustable slide closure with buckle and grommet ..